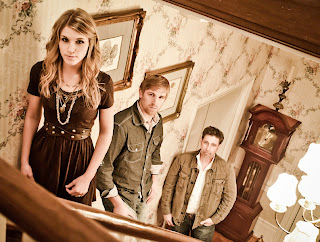 The Henningsens are an up-and-coming country music group from Atwood, Illinois and Primm Springs, Tennessee. They are a family group comprised of daughter Clara, son Aaron and father Brian. They were originally noticed for their writing skills and over the past year have written such hits as You Lie recorded by The Band Perry, Sara Evan's soon to be released single Alone and the title track of Highway 101's just released Christmas album, Six Gold Coins. It has only been recently that the band have begun to be noticed for their singing talents as well. One of my favourite songs of theirs is Daddy Buy Me A Gibson. Clara's vocals are very impressive and Aaron and Brian contribute strong harmonies. In my opinion Daddy Buy Me A Gibson is one of those songs where it's very important to listen to the lyrics, something that has probably come from the fact that The Henningsens are such good songwriters. The song starts with a simple use of vocals and guitar and then nicely builds up as more instruments are added. Their single American Beautiful is a very strong song. It is one of their more upbeat cuts and having the riff from the solo electric guitar at the beginning really builds up the atmosphere well. Once again the group's vocals shine and complement each other. They are a very strong group and manage to stay different to other trios such as Lady Antebellum and appeal to fans of both modern and older country. I'm really happy to have been introduced to their music and I hope to see them in the UK very soon! Five stars for a group who seem like a really close family unit.